How the cost of finding and fixing defects increases with time. The cost of detecting and fixing defects in software increases exponentially with time in the software development workflow. 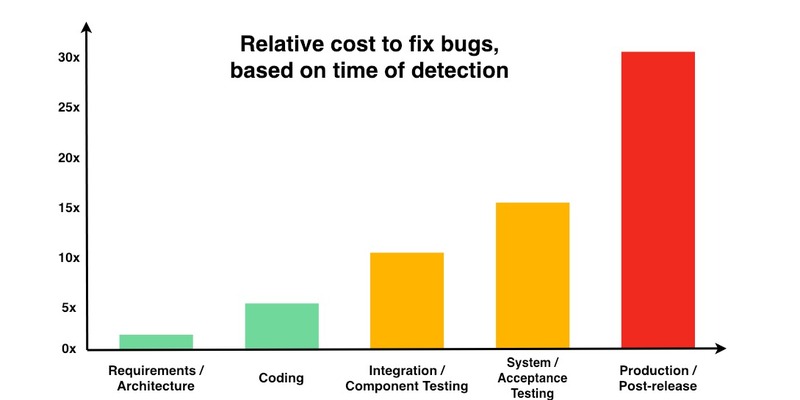 Fixing bugs in the field is incredibly costly, and risky — often by an order of magnitude or two. The cost is in not just in the form of time and resources wasted in the present, but also in form of lost opportunities of in the future. The following graph courtesy the NIST helps in visualizing how the effort in detecting and fixing defects increases as the software moves through the five broad phases of software development. It is much easier to detect issues in code when developers are still writing the code. Since the code is still fresh in the mind, it’s trivial to fix even complex problems. As time passes and the code moves to later stages, developers need to remember everything and hunt down issues before they can fix them. If an automated system, such as a CQ integration, highlights issues in code when the developers are still writing the code, they are much more amenable to incorporate the fix for the same reason. Once the software is in the testing phase, reproducing the defects on a developer’s local environment presents another time-consuming task. Additionally, while it’s very easy to catch something that’s obviously broken or not according to the requirements, it is incredibly difficult to uncover defects which are more fundamental — think about memory leaks, race conditions, etc. If these issues escape the coding phase, they generally don’t present themselves until in production phase, unfortunately. After the software has been released and is out in the field, it’s not just difficult to find defects — it’s incredibly risky as well. In addition to preventing live users being affected by the problems, ensuring availability of the service is business critical. These effects compound and the heightened cost is as high as 30x as compared to if these defects are fixed early on. The arguments above withstanding, it is valuable to implement processes which enable developers to detect early, detect often. Essentially, the development workflow should ensure that defects can be detected as early as possible — preferably during the code is being written by the developer or is in code-review stage before being merged to the main development branch. Processes like CI help ensure that changes to the code are small and manageable, so it’s easier to detect issues. Tracking code coverage and ensuring that a certain threshold is helpful, and facilitate iterations on the code to fix these issues. In essence, processes and conventions should be designed around moving defect detection as early in the workflow and as closer to the developer’s coding environment as possible. This way, the same compounding effects which inflate the negative impacts of late defect detection work in favor of increasing software quality and resilience.